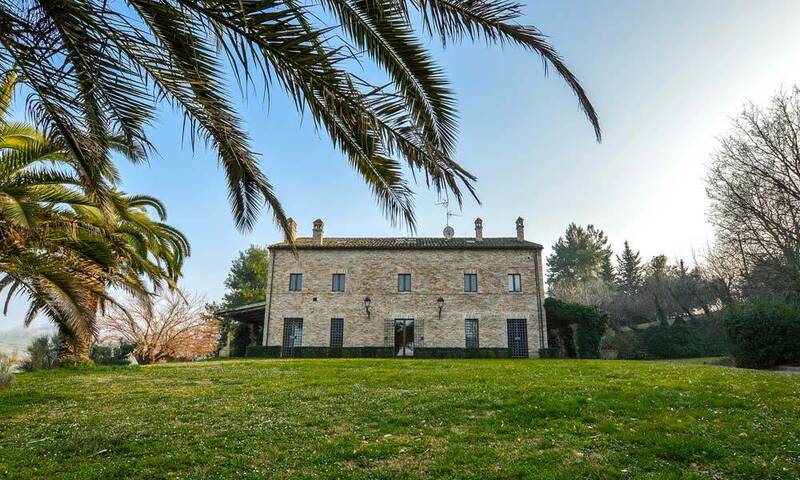 Recently restored country house with separate guesthouse and natural terrace with stunning views over the valley. 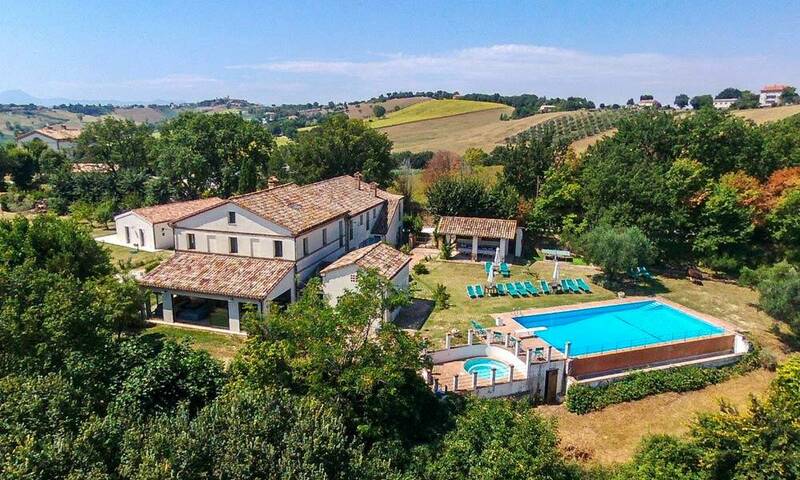 The property has been fully restored and is constantly maintained by the current owners, according to the architectural tradition of region Marche and retaining many original materials and features. There is so much to take in here and so much opportunity: family home, bed and breakfast business or both? This property has potential to do whatever you want, thanks to the clever division of the space, while restoring. The main building is divided into 2 independent apartments. The first one is smaller and meant for the rental business: it is located on the ground floor. The total area is about 85 sq.m., featuring a spacious open-plan kitchen and living room of about 34 sq.m., a double bedroom and a bathroom with shower. Many of the old characteristics of the building are still preserved and restored: oak beams, main entrance door (currently not in use), niches on the walls, so that also your guests may feel the special atmosphere of past times. The big apartment, currently the owners’ home, develops on the first and second floors. It is about 162 sq.m. and access is via a typical external staircase. As you step into the house, you enter a spacious living room of about 34 sq.m. with a cast iron ventilated fireplace, where many of the original features have been kept as the ceiling, which was restored with the typical wood beams and cotto tiles. From all windows, you can enjoy a marvellous view over the multicoloured countryside, stretching onto the mountains. A hallway divides the living area from the kitchen and dining area, which are separated by an arch, thus creating 2 different settings, yet keeping an open and luminous look. A staircase with lovely small balcony, will lead you to the upper floor, where the sleeping area is located. Here you can find three large bedrooms, all equal in size (4x4m), and a large bathroom (3x4m). One bedroom has stairs with a small landing that gives access to the attic (40 sq.m.) and an access to the roof. Ceramic tiles in terracotta stile are laid throughout the whole main building. The original stones, used to build the house, appear here and there in a game of contrast between stones and plaster. All rooms are fitted with aluminum radiators and double glazed windows. On the ground floor of the main building there is also a technical room with external access for the boiler. This room also houses the pellet heating system and geyser for hot water, plumbing for washing machine. Still on the ground floor there is a small wine cellar (2,5×1 mt.) and a small storage room which contains the main fuse box. At the moment the small and big apartments in the main building are fully independent, but the small apartment may be rejoined to the big one, by simply removing a plasterboard wall. Beside the main building there is a lovely annex with an apartment of about 53 sq.m., excellent for your guests or to be rented out. Guests will be in their corner of paradise here, thanks to the fully equipped kitchen/living room and the double bedroom with en-suite bathroom. The dependance enjoys a small terrace with views, placed on the opposite side of the house, thus guaranteeing full privacy: your guests can also have al-fresco dinners far from prying eyes. On the opposite side of this small apartment, facing the main house, there is the garage (26 sq.m. ), a wood storage and a pizza oven. It will be very nice to cook some pizza and eat it out on the long table set on the platform near the annex. A tool shed (4x3m) is located at the top of the drive and there is a parking space for at least 5 cars. The land surrounding the property is approximately 4.500 sq.m., with 40 olive trees and fruit trees. Four natural terraces, will guarantee beautiful views, that you can enjoy also from the wood gazebo. On a lower level, there is the pool: also from this location, the views are unique. The property is placed at the end of a quiet road but very close to town: you can reach Cupramontana with a 10 minutes walk. In town you can find all services, as well as nice bars and restaurants. Cupramontana is also known for its wineries, so you can enjoy a good time with wine tastings. This is the perfect combination for living and renting: you are in the middle of the nature, with all services at your fingertips. This is a great advantage also for the guests, who take it for rent, who normally look for nice locations, close to town and this is a plus that just a few can boast. One of the many delights of this home is that it doesn’t reveal its true self until you are properly wandering through and there is a real thrill as you discover what’s around the next corner. The best thing is for you to come and experience it first hand, to get a feel of how this house impresses from the moment you walk in. LAND / GARDEN: 4.500 sq.m.